If you don’t have time to sit down for a full meal, a new concoction from Red Robin concentrates the taste of one of their signature burgers into a glass of beer. The Grilled Pineapple Golden Ale looks like an unassuming beverage, but the flavor is anything but: it’s infused with brown sugar, ginger, pineapple, and black malt to impart a beefy, umami quality. The beer, which is set to debut at Denver’s Great American Beer Festival in October, is a collaboration between the burger chain and New Belgium Brewing Company. 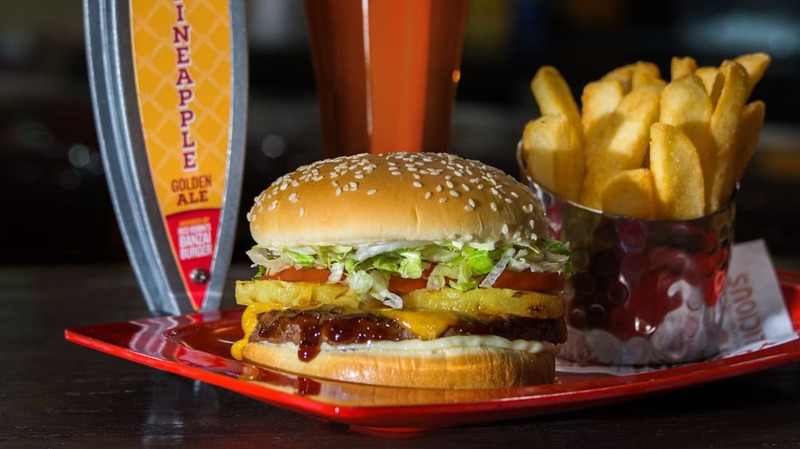 The flavor profile is modeled after Red Robin’s Banzai Burger, a bold menu item topped with grilled pineapple and teriyaki sauce. According to Mashable, other burgers were considered for the experimental brew but none could compare to the Banzai’s unique style. After its unveiling at the Great American Beer Festival, the Grilled Pineapple Golden Ale will be available on tap for a limited time at Red Robin locations in Colorado, the same state that brought us Rocky Mountain Oyster Stout.